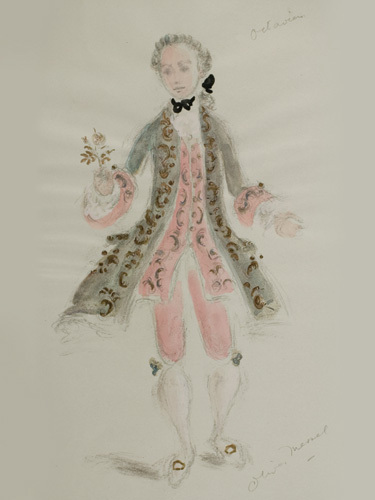 Oliver Messel was Great Britain’s leading theatre designer from the 1930s to the mid 1950s. 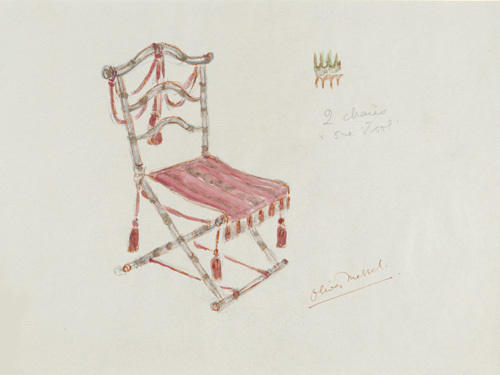 He transformed British theatre design with his lavish, painterly and poetic style of design, leaving a lasting legacy to his followers. 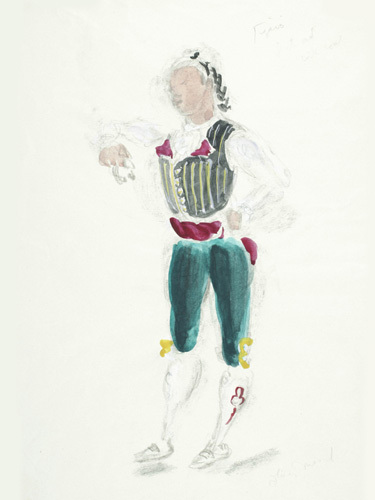 His work spans revues, musicals, theatre, ballet, opera and film. 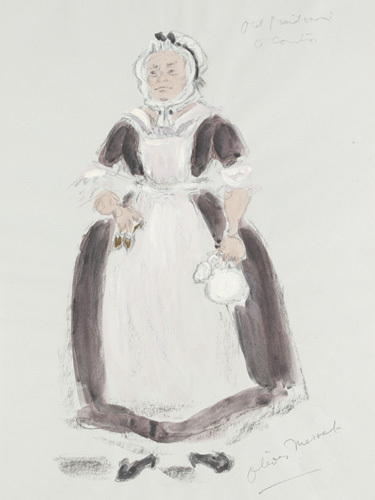 Peter Brook acknowledged him as ‘by far the most talented designer of his generation’ and the stage designer Desmond Heeley said he was ‘one of the greatest set and costume designers England has ever produced’. 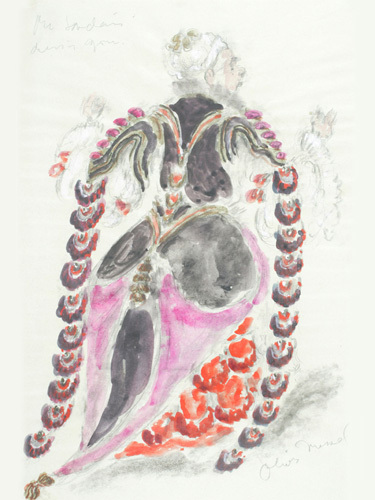 Painterly theatre sets composed of borders, painted flats, cutcloths and backcloths, accompanied by colourful and opulent costume designs, in a pastiche of historical styles made him the most highly paid and sought after theatre designer in the World. 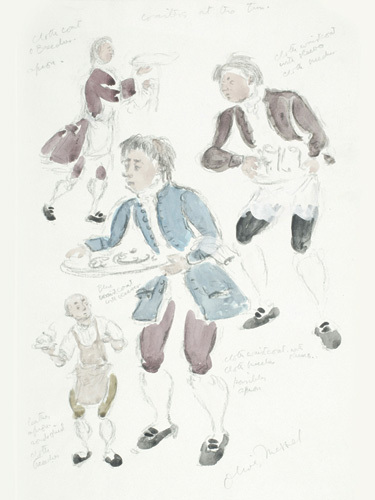 Faced with dwindling theatre design commissions from the mid 1950s onwards due to the rise of ‘Kitchen Sink Drama’, he concentrated on opera and musical theatre and developed parallel artistic outlets in decorative art, interior design and architectural projects in Great Britain, United States and the West Indies. 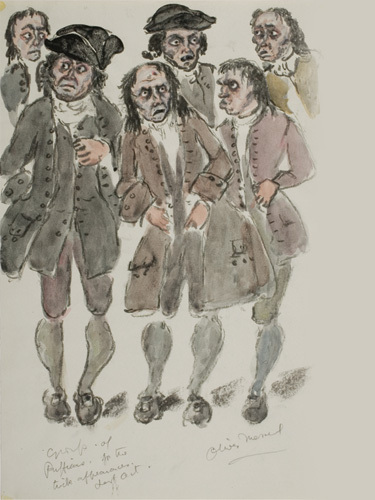 Throughout his career, he also worked and exhibited as a painter. Messel was born in 13 January 1904 to Maud Frances (1875-1960), daughter of the Punch cartoonist Edward Linley Sambourne (1844-1910), and Lieutenant-Colonel Leonard Charles Rudolph Messel (1872–1953), of Nymans, Cuckfield, Sussex, a soldier and a stockbroker with strong cultural interests. 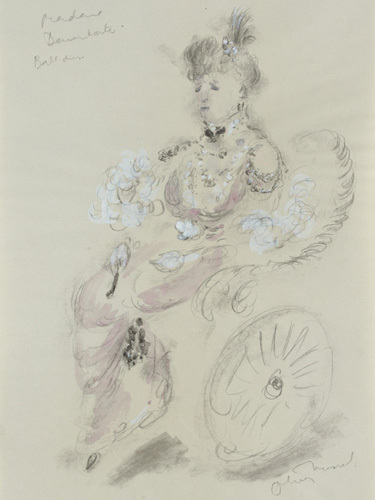 In 1922, after an education at Eton, he studied to be a painter at the Slade School of Fine Art under Henry Tonks; Rex Whistler was a fellow student. 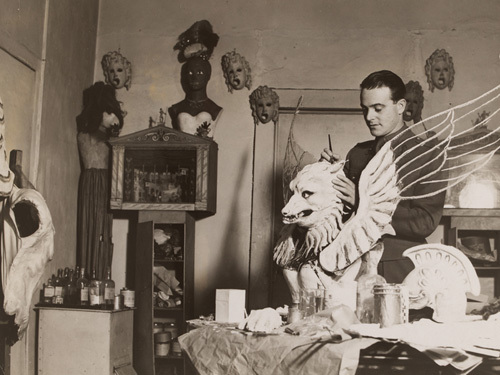 His formal studies concentrated on life drawing and painting, but he also made masks from papier maché and wax for student events. 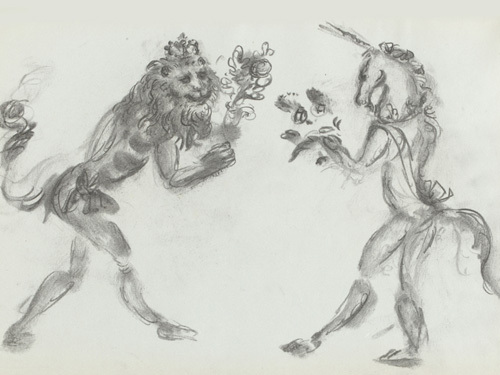 An exhibition of his masks at the Claridge Galleries in London in 1925 led to his first theatre design commission to design masks for the prestigious Diaghilev ballet production of Zéphyre et Flore, directed by George Braque and performed at the London Coliseum in 1925. 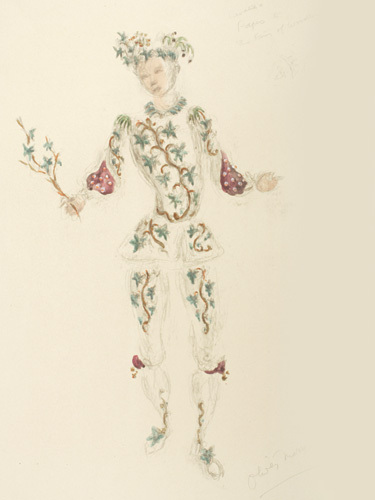 From 1926 onward, Charles B. Cochran engaged Messel to design costumes, masks and sets for his annual revues at the London Pavilion; these revues, consisting of songs, sketches and chorus numbers, provided him with ample opportunities to develop and exercise his talent for minute attention to detail, inventive use of materials and imaginative pastiche of historical periods and styles. 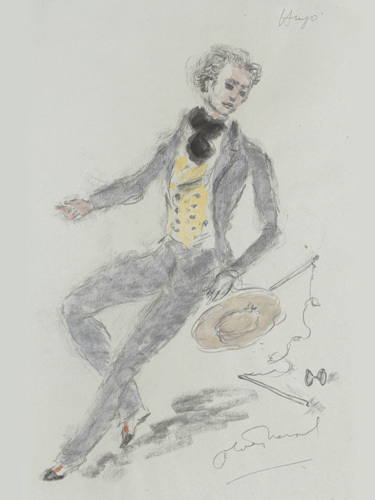 His reputation grew slowly; most notably, his disturbing masks for ‘Dance, Dance, Little Lady’, a song by Nöel Coward from the 1928 Cochran revue entitled ‘This Year of Grace’ attracted the attention of critics; the scene was described by James Laver as “a modern Dance of Death.” (Laver, 1933). 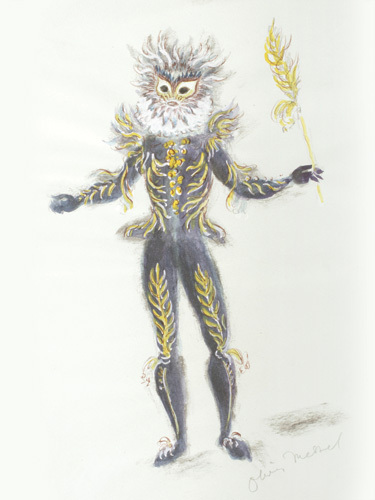 Messel’s fashionable and inventive costumes and sets for Cochran’s Helen! 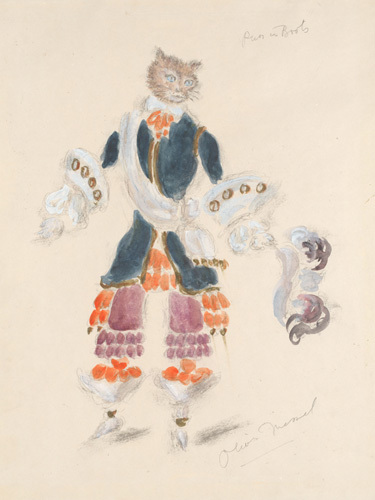 an opera bouffé directed by Max Reinhard and performed at the Adelphi Theatre, London in 1932 sealed his critical success and he secured a steady stream of prestigious London theatre design commissions throughout the 1930s and 1940s. 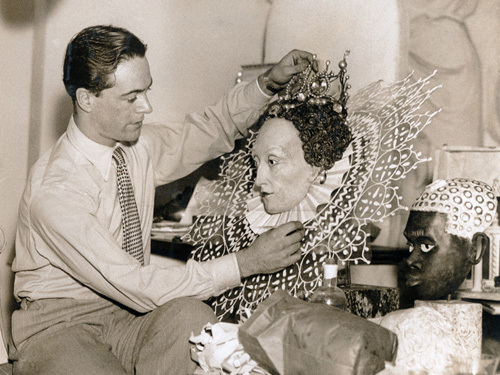 He also designed costumes and sets for film productions including Hollywood films such as Romeo and Juliet (George Cukor, 1936), and Caesar and Cleopatra (Gabriel Pascal, 1946), both of which showed his skill in creating a playful and sophisticated pastiche of historical styles. 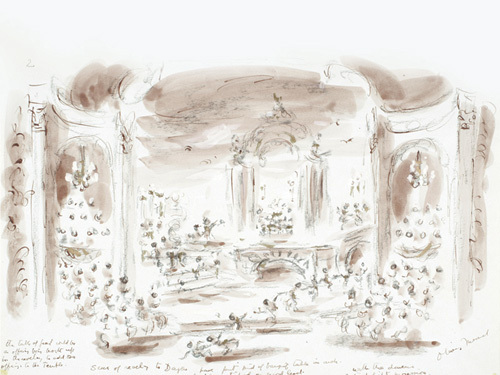 Perhaps Messel’s finest moment was designing the sets and costumes for the Sadler’s Wells Ballet performance of Sleeping Beauty at the Royal Opera House, London in 1946. 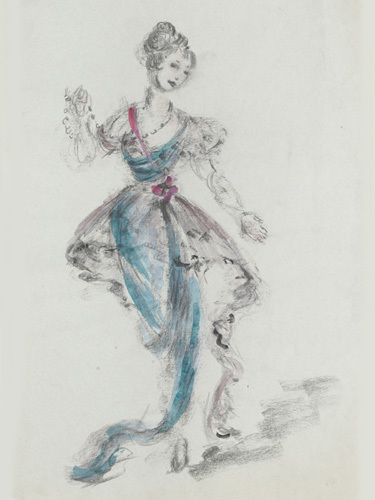 His fantastic and flamboyant designs and inventive use of unusual materials (due to scarcity of conventional materials in post-war Britain) provided the perfect antidote to British post-war austerity, and the ballet became known as the ‘Messel Production’. 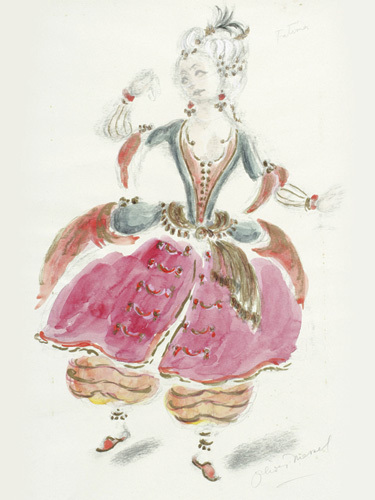 His designs endured many Royal Ballet revivals to 1970. In the late 1940s and early 1950s, Messel’s poetic and painterly vision was a good complement for the new verse play theatre movement, spearheaded by Christopher Fry. He designed costumes and sets for The Lady’s Not for Burning (1949), Ring Round the Moon (1950) and The Dark is Light Enough (1954). 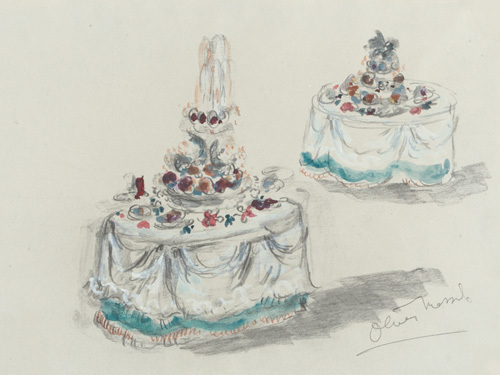 His lavish approach to costume and set design was particularly appropriate for opera; from 1951 to 1959 he worked as a theatre designer for the Glyndebourne Festival Opera, then under the artistic direction of Carl Ebert. His productions include Idomeneo (1951), La Nozze di Figaro (1955) and Der Rosenkavalier (1959), productions which enabled Messel to use his imaginative pastiche of historical styles to good effect. 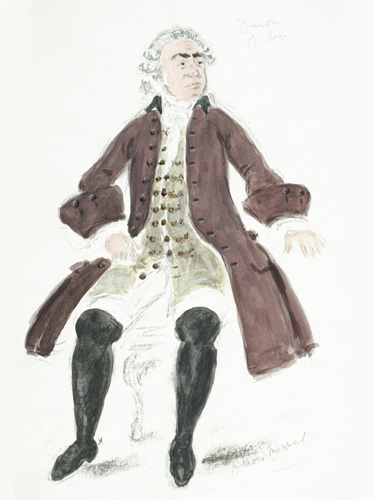 Carl Toms assisted him during the Glyndebourne period, from 1952 to 1959. 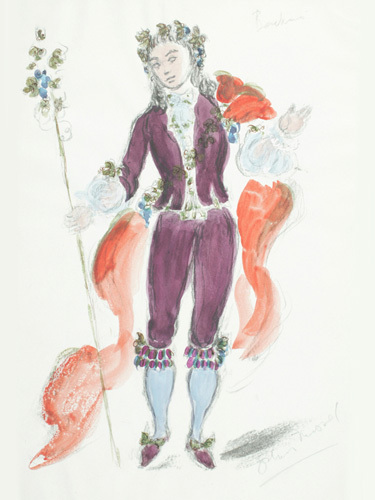 During the 1950s, Messel increasingly designed costumes and sets for American theatre productions: Romeo and Juliet (1951) was his debut on Broadway at the Broadhurst Theatre, New York; other Messel productions in the United States include the House of Flowers (1954) at the Alvin Theatre, New York and the La Nozze di Figaro (1959) at the Metropolitan Opera House in New York. In film, he was nominated for two Oscars for the set of Suddenly Last Summer (1960); the creepy garden setting expressed another side to his style described by Roger Pinkham as “eerie, more imaginative and wilder’ (Pinkham, ed. 1983); this quality can also be seen in designs for theatre productions such as The Queen of Spades (1950) and The Little Hut (1950). 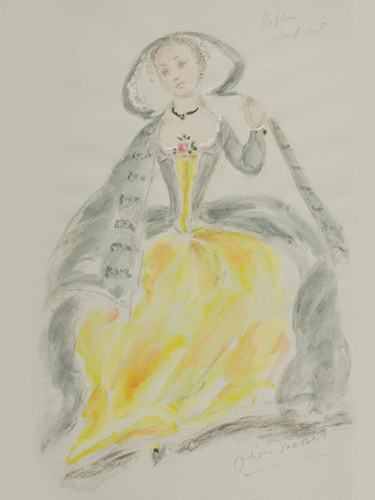 Messel’s theatre commissions began to dwindle after the mid 1950s, partly due to the expense of executing his extravagant designs and use of expensive materials, and the rise of new forms of drama such as ‘Kitchen Sink Drama’ exemplified by John Osborne’s Look Back in Anger, shown at the Royal Court Theatre in 1956, and he concentrated on designing opera and musical theatre productions. 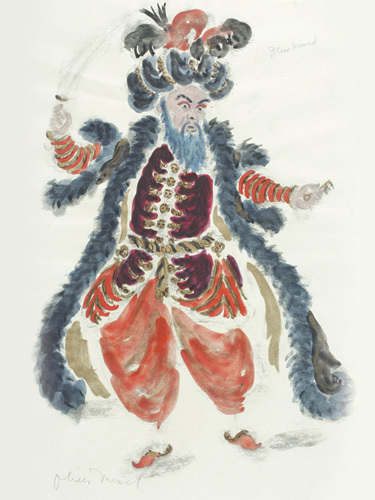 In addition, he received commissions for decorative art and interior design projects. 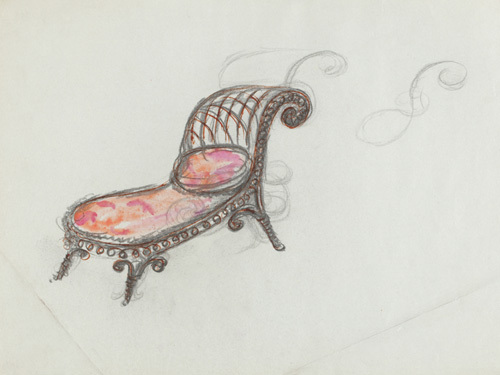 Most notably, he formed an association with the silk manufacturer Sekers to design silk brocade patterns to commemorate Queen Elizabeth’s coronation in 1953, and he executed interior design commissions at the Dorchester Hotel (1953), Rosehill Theatre, Whitehaven (1959) and Bath Assembly Rooms (1963). He also created temporary decorations, for balls, festive occasions and shop displays. For financial and health reasons, Messel moved to Barbados in 1966 where he painted portraits of the residents and carved out a new career as an architect, designing and decorating villas for private clients in the West Indies. 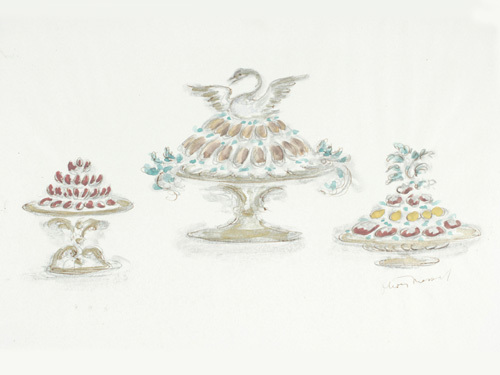 He defined a style of architecture and design on the hitherto undeveloped Island of Mustique, designing luxurious villas with magnificent views based on the style of French plantation houses on the Island. 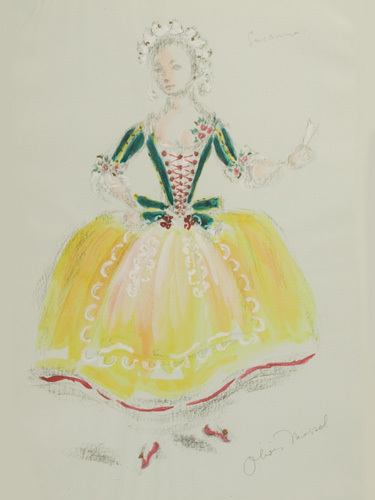 He briefly returned to theatre design in the United States for the musical production Gigi (1973) and was asked to recreate his Sleeping Beauty designs of 1946 for the American Ballet Theatre production of Sleeping Beauty at the Metropolitan Opera House, New York in 1976. He died at Maddox, his Barbados home, on 13 July 1978.